Jimi Hendrix: Electric Church and Joni 75 are both playing at SIFF, though not on the same night. "I have to confront my demons," says Skeleton Flowers cocreator Haruko Crow Nishimura. An artist's "intervention" at SAM highlights a history hiding behind beautiful objects. What's Wrong with Lake City? Novelist Thomas Kohnstamm satirizes a local fictional loser. If you're alone on Valentine's Day, look no further. I Have a Thing with Cancers. Not the Disease, the Sign. Taurus vs. Cancer: A nutty romantic odyssey. The slapstick comedy of trying to go on dates when you have a 1-year-old. What we know about the mayor and the art scholar. Are Your Date Nights Getting Uncreative? Try Mystery, and Let Them Do the Work. It requires a leap of faith. It's kind of like a wedding ring for single people. 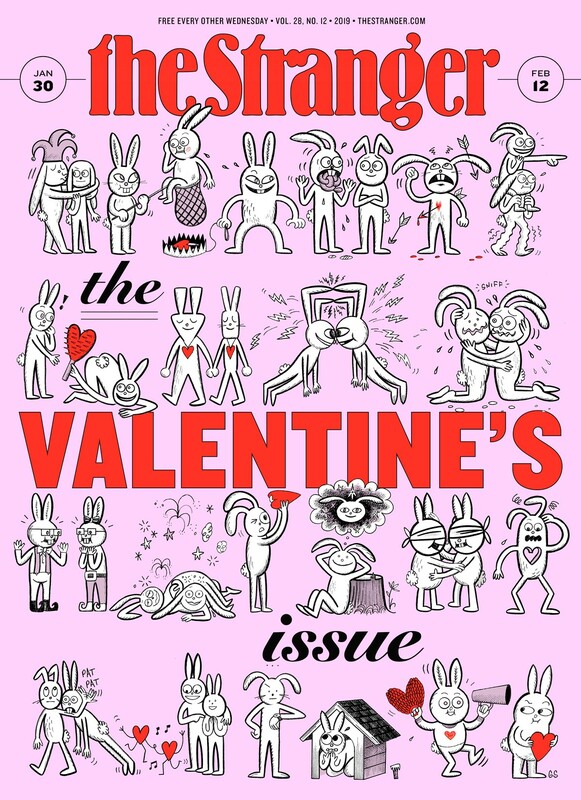 Welcome to The Stranger's 2019 Valentine's Issue. Did you know they're putting an eight-lane road on the waterfront right above it? The trickiness of being in a mixed couple. We sued the government on your behalf and won.